Soft, weather resistant neoprene case with wrist strap protects your camera from scratches and provides the perfect storage for your camera. Features an outside pocket for media cards and a velcro beltloop. For UZ 590 - no way!! 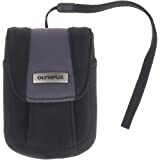 I used to use a leather camera case for my Olympus camera. However after I stared to use this camera case, it provides much more protection for my camera. Now, I am much more ease with my camera in my purse. I wanted a case for my Olympus 1030SW - something compact just like the camera. I also have the Silicon Cover for the camera. With the cover on the camera it slides in nicely into the case. There is a pocket on the front and while there is not a zipper/button/velcro specifically for the pocket, it does get covered up by the flap of the main body of the case - so it does get protected. The pocket is big enough for a second battery and a media card. It has both a wriststrap and a velcro belt loop. Would definitely recommend this product for the 1030SW.